Eigenlob riecht unangenehm... aber ich mag die Farbkombi mit den schwarzen "Diamanten". Sooooooo romantisch, find ich. Der embosste ovale Rahmen ist übrigens ein SU Folder mit nem Spelli ausgeschnitten. deine Karte ist einfach super geworden,gefällt mir sehr gut. 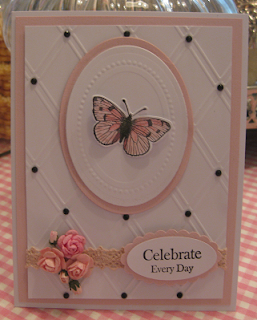 Very pretty and elegant card, thanks for joining us over at Kraftyhands. I am loving your card with that super cute butterfly and it's simplicity is what makes it so stunning! Thanks for playing along with us at Brown Sugar this week. Elegance comes to mind when I look at your card. Just beautiful. Thank you for joining us at FSC! Your card is simple, classy and elegant. Gorgeous card, love the image and beautiful design. Thanks for joining us at Milk Coffee. Good Luck!